The Deep Carbon Observatory (DCO) is an international network of nearly 900 multi-disciplinary scientists committed to investigating the quantities, movements, forms, and origins of carbon in deep Earth. The Alfred P. Sloan Foundation (New York) provides core support for the DCO. 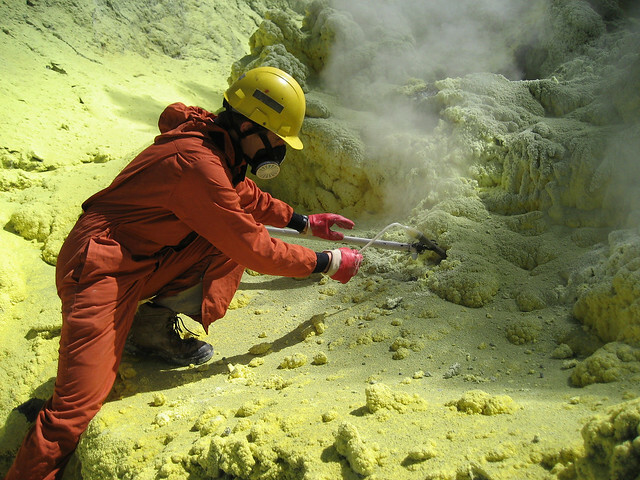 DCO launched the Deep Earth Carbon Degassing (DECADE) initiative in 2012 to refine global estimates of carbon fluxes out of volcanoes. 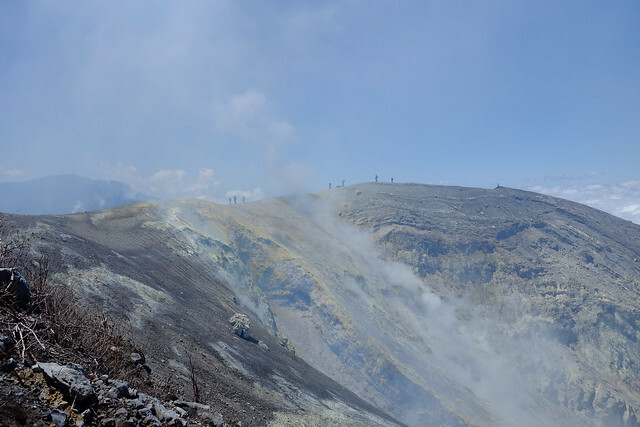 Involving more than two dozen researchers from 11 nations, DECADE aims to install carbon dioxide monitoring networks on 15 of the world’s 150 most actively degassing volcanoes and undertake related studies to investigate direct degassing of deep carbon to Earth’s surface. The National Museum of Natural History is part of the Smithsonian Institution, the world’s preeminent museum and research complex. The Museum is dedicated to inspiring curiosity, discovery, and learning about the natural world through its unparalleled research, collections, exhibitions, and education outreach programs. The mission of the Smithsonian’s Global Volcanism Program (GVP) is to document, understand, and disseminate information about global volcanic activity through four core functions: reporting, archiving, research, and outreach. 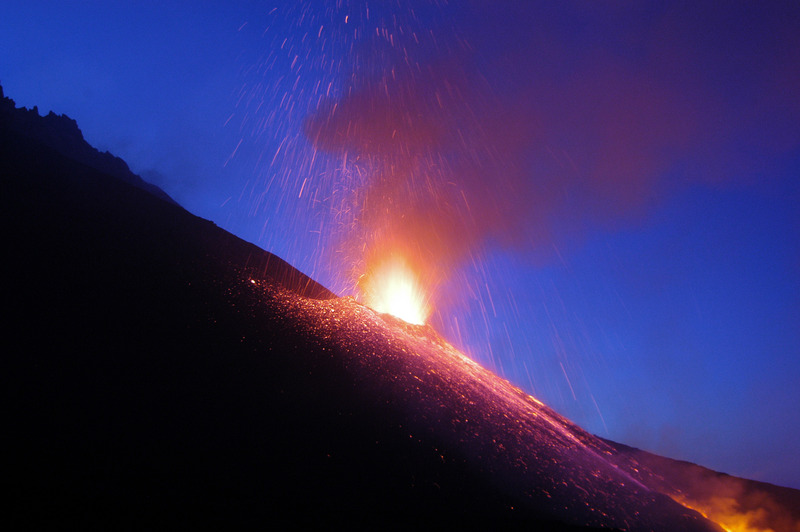 The data systems that lie at the program’s core have been in development since 1968 when GVP began documenting the eruptive histories of volcanoes. The crater lake of Póas volcano in 2014. 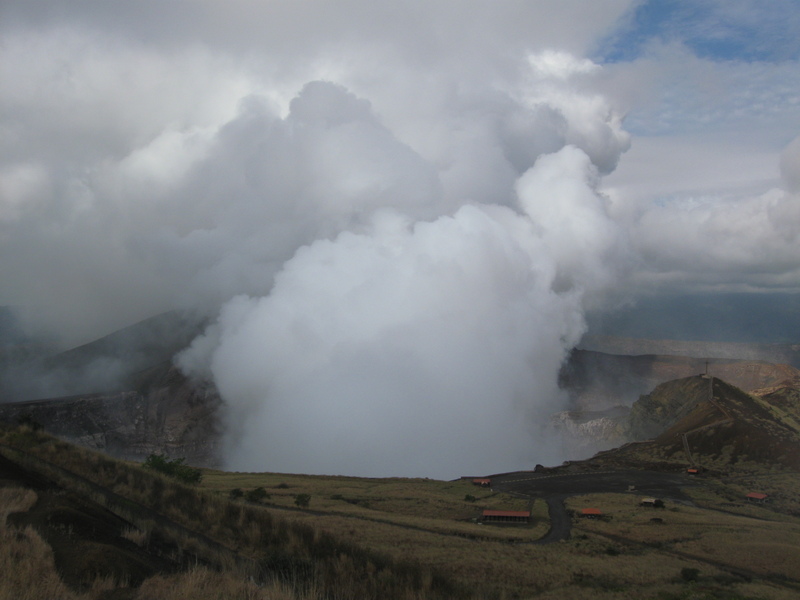 Using DECADE permanent gas monitoring devices, DCO scientists observed remarkable changes in gas emission compositions before eruptions at Póas and Turrialba volcanoes in Costa Rica. Credit: Katie Pratt, University of Rhode Island, USA. 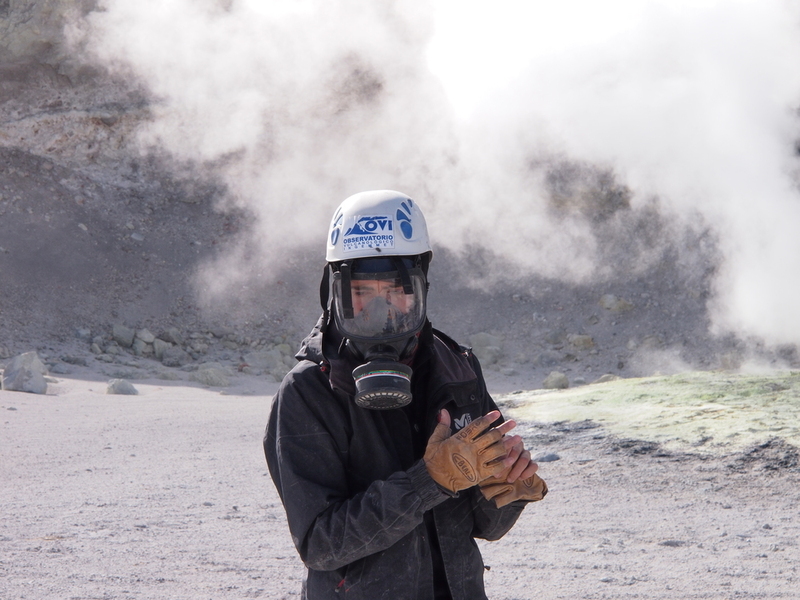 DECADE’s Taryn Lopez (University of Alaska Fairbanks, USA) collects gas samples at Kanaga volcano in the Western Aleutian Islands. Credit: Tobias Fischer, University of New Mexico, USA. 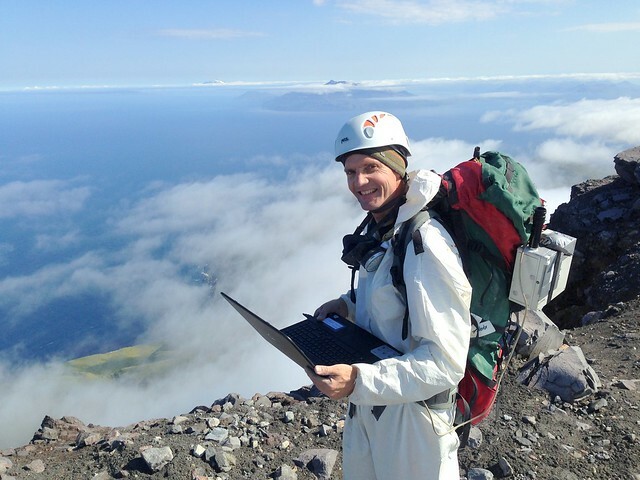 Tobias Fischer (University of New Mexico, USA) collects measurements of volcanic sulfur dioxide in the sky overhead using a Differential Optical Absorption Spectrometer on the summit of Kanaga volcano in the Western Aleutian Islands. Credit: Taryn Lopez, University of Alaska Fairbanks, USA. Elizabeth Cottrell (Smithsonian Institution, USA) collects fragmented material that resulted from an eruption of Gareloi volcano. Credit: Taryn Lopez, University of Alaska Fairbanks, USA. 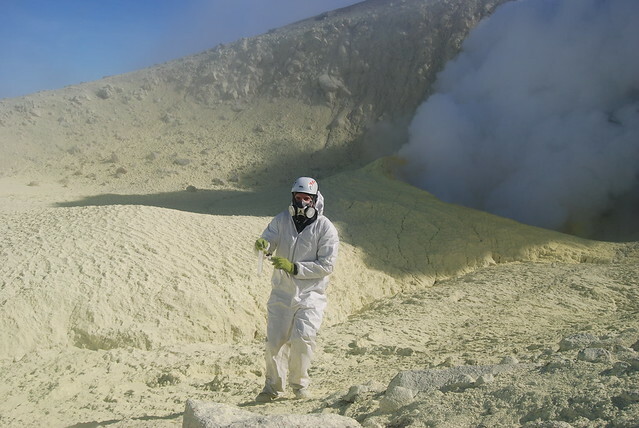 Volcanologist Yves Mousallam (University of Cambridge, UK) wears a gas mask, helmet, and protective clothing before approaching the active vent of Chillán volcano in Chile. Credit: Trail by Fire Team. 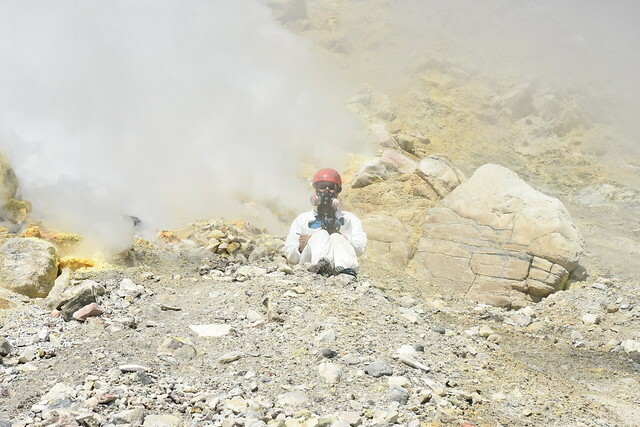 Volcanologists Ian Schipper (Victoria University of Wellington, New Zealand) and Aaron Curtis (New Mexico Tech, USA) sampling the fumaroles from Ticsani volcano in southern Peru. Credit: Trail by Fire Team. Volcanologist Aaron Curtis Curtis (New Mexico Tech, USA) on the long climb to the summit of Sabancaya volcano in southern Peru. Credit: Trail by Fire Team. Masaya volcano in Nicaragua is one of the strongest volcanic point sources in the Central America Volcanic Arc. Because of its relatively low elevation (approximately 500m a.s.l. ), gas emissions from Masaya have a significant impact on the surrounding area. Credit: Marco Liuzzo, INGV Rome, Italy, Alessandro Aiuppa, University of Palermo, Italy, and Angélica Muñoz, The Nicaraguan Institute of Territorial Studies, Nicaragua. 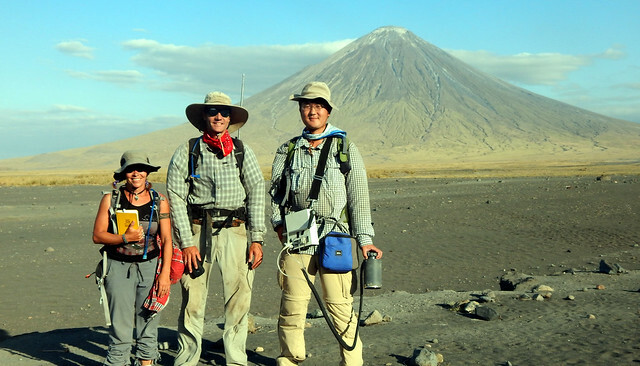 DECADE leader Tobias Fischer (University of New Mexico, USA; center) and graduate students Nicole Thomas (left) and Hyunwoo Lee (right) during a field expedition. Credit: Kerstin Lehnert, Lamont Doherty Earth Observatory, USA. Volcanologist Tobias Fischer (University of New Mexico, USA) samples gases emitted from a sulfur-caked fumarole on Póas volcano in Costa Rica, one of the 15 volcanoes in DCO’s DECADE gas monitoring network. Credit: Raúl Mora-Amador & Carlos Ramírez U, University of Costa Rica. 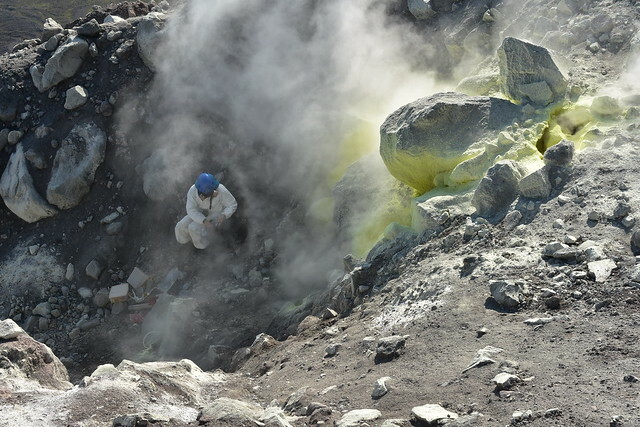 Tobias Fischer (University of New Mexico, USA) returns from collecting a gas sample from the vigorously degassing fumarolic region on the flank of Kiska volcano in the Western Aleutian Islands. 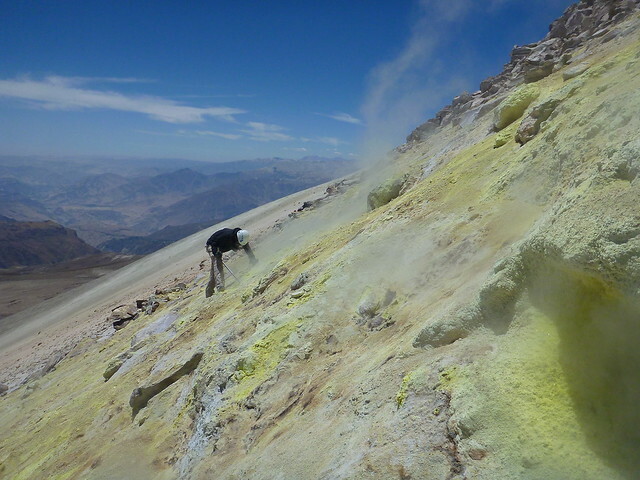 Yellow sulfur deposits cover the ground. Credit: Taryn Lopez, University of Alaska Fairbanks, USA. Tobias Fischer (University of New Mexico, USA) hikes down the steep crater wall of the vigorously degassing Gareloi volcano in the Western Aleutian Islands to collect a volcanic gas sample. Credit: Taryn Lopez, University of Alaska Fairbanks, USA. DCO scientists walking the crater rim at Turrialba volcano in Costa Rica just before it erupted in early 2014. Over the last few weeks, Turrialba has deposited ash on the capital city of San José, affecting about 3 million people and closing the international airport. Credit: Katie Pratt, University of Rhode Island, USA. 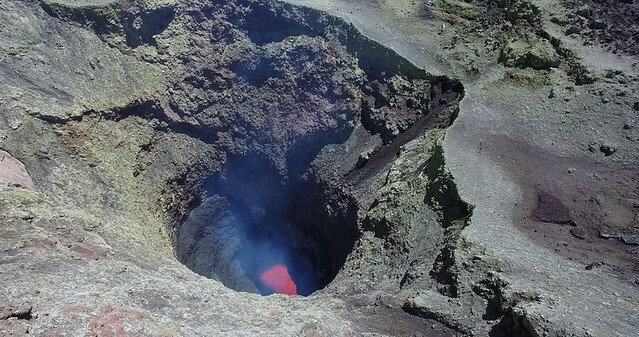 Aerial view of the lava lake in Villarrica volcano, taken by an unmanned aerial vehicle looking down into the crater. Credit: Trail by Fire Team. Volcanologist Yves Moussallam (University of Cambridge, UK) probing the best sampling site on the slope of Ticsani volcano in southern Peru. Credit: Trail by Fire Team. 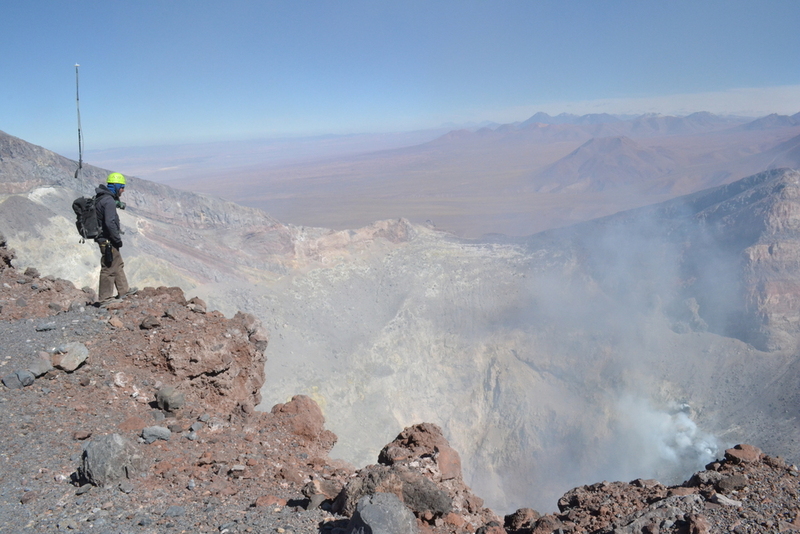 Overlooking the crater of Lascar volcano, Chile. Credit: Trail by Fire Team. Hover over clips to preview. Click on the titles to download full video clips. 1:55 minutes of video with sound. 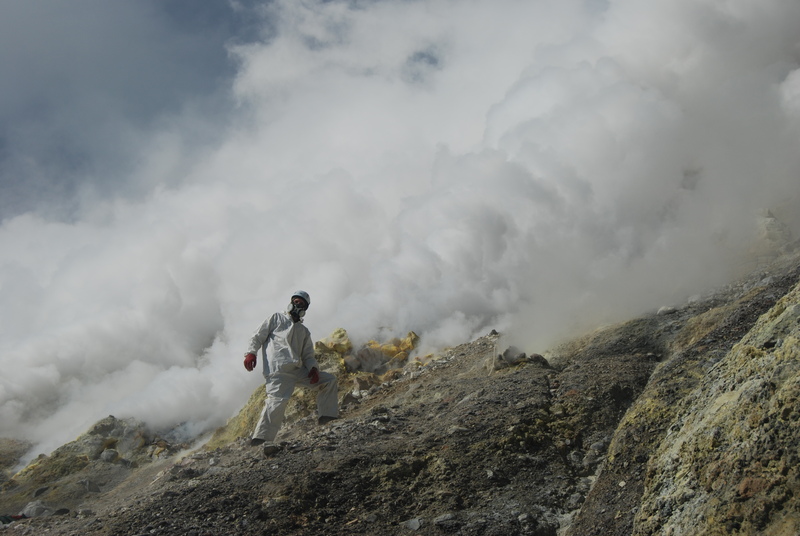 Volcanologist Maarten de Moor with the National University of Costa Rica’s Observatorio Vulcanológico y Sismológico de Costa Rica explains how a multi-GAS monitoring system works on location at Turrialba in Costa Rica. The equipment is used to measure carbon dioxide, sulfur dioxide, and hydrogen sulfide emissions from volcanoes. (95.5 MB) © Maarten de Moor, 2016. Please acknowledge copyright when using video. 3:32 minutes of helicopter aerial and Go-Pro footage showing researchers climbing and descending four volcanic sites in the Western Aleutian Islands. (182.7 MB) © Tobias Fischer, 2016. Please acknowledge copyright when using video. 27 seconds showing drone footage over Lastarria that moves in and out to provide a close-up view of fumaroles and gives a sense of the rugged, colorful landscape. 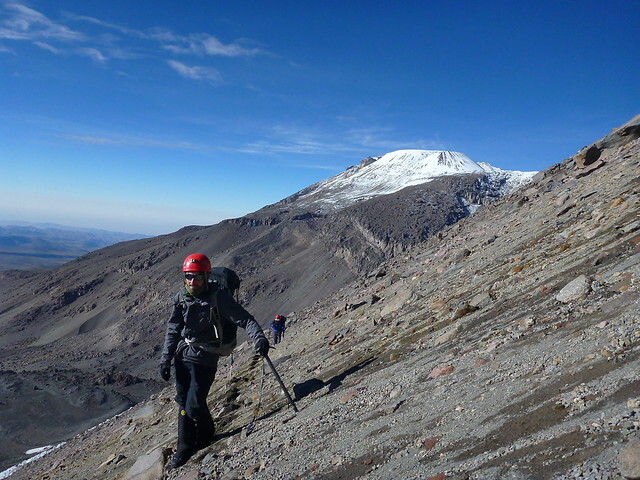 Lastarria is a stratovolcano (a volcano built up of alternate layers of lava and ash) on the Argentina/Chile border. The volcano contains 5 nested summit craters. (10.8 MB) © Trail by Fire, 2016: Yves Moussallam, Ian Schipper, Aaron Curtis, Talfan Barnie, Philipson Bani, and Nial Peters. Please acknowledge copyright when using video. 1:13 minutes showing drone footage over Nevados de Chillán volcano in central Chile, one of the country's most active volcanoes. It is composed of 3 overlapping stratovolcanoes (a volcano built up of alternate layers of lava and ash) located on a NNW-SSE-trending line. (22.6 MB) © Trail by Fire, 2016: Yves Moussallam, Ian Schipper, Aaron Curtis, Talfan Barnie, Philipson Bani, and Nial Peters. Please acknowledge copyright when using video. 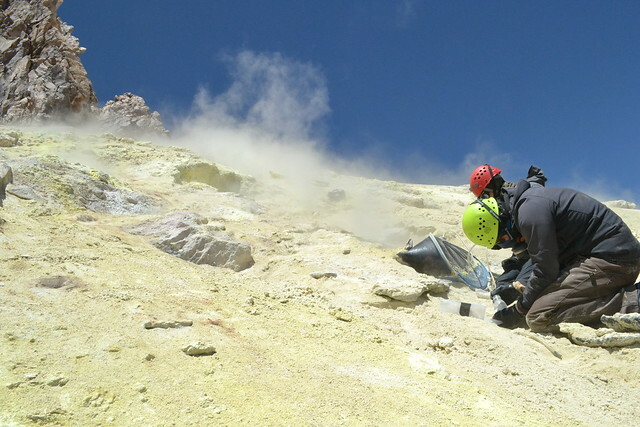 53 seconds showing two researchers installing gas-monitoring equipment atop Turrialba Volcano in Costa Rica. The equipment measures the concentration of several gases, including carbon dioxide and sulfur dioxide. 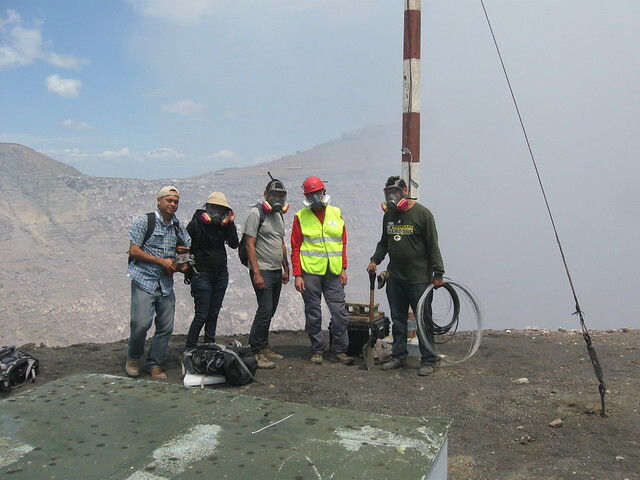 Footage of the installation of the solar panel (0'35) was shot at Poás volcano. (10.8 MB) © Geoffroy Avard, 2016. Please acknowledge when using video. 38 seconds of aerial shots taken by a drone of sampling of Tacora fumarole (an opening in or near a volcano). Tacora volcano is the northernmost volcano in Chile and located near the Bolivian border. (12.3 MB) © Trail by Fire, 2016: Yves Moussallam, Ian Schipper, Aaron Curtis, Talfan Barnie, Philipson Bani, and Nial Peters. Please acknowledge copyright when using video. 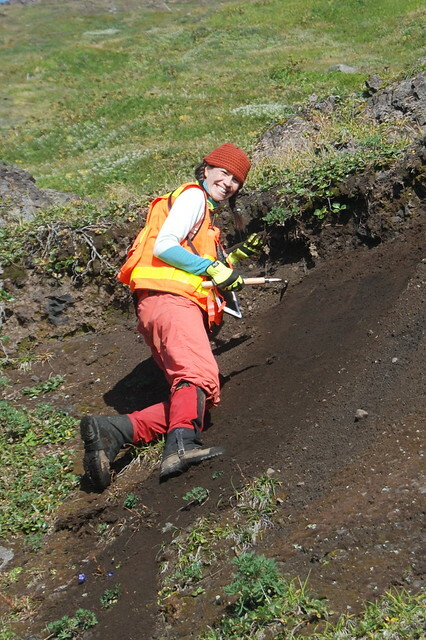 Image: DECADE’s Taryn Lopez (University of Alaska Fairbanks, USA) working on Gareloi volcano in the Western Aleutian Islands. Credit: Tobias Fischer, University of New Mexico, USA. A short demonstration of the changes in carbon dioxide to sulfur dioxide gas ratios that occur before, during and after eruptions. Note the footage under the data is for demonstration purposes only and is not from the volcano during the same time frame. Data supplied by the DCO DECADE project.